Education | Major Medical Hospital Services, Inc.
Major Medical/Medical Gas Certifications, Inc. specialize in medical gas training and certification programs for the healthcare industry. Our certification programs are 100% web based, available 24×7 and eliminate the need for off-site training. 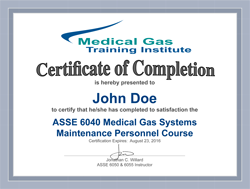 Medical Gas Certifications, Inc. is the only training company to provide medical gas certifications utilizing web based audio-visual instruction and online examinations to meet the requirements of the ASSE 6000 Professional Qualifications Standard. No Time Constraints – You have 365 days to complete once you begin. Each of the ASSE 6000 courses are self-paced. Schedule your training for when time permits. Available 24×7 – All you need is a computer with internet connection. The ASSE 6005, 6020 and 6040 are completely web based. Technical Questions Answered – If you need clarification during the course simply submit your question. Our ASSE 6050 Instructor is available for technical clarification. For more information visit the ASSE 6005, 6020 and 6040 certification pages. Or, simply click on the register links above.